Though Founders Brewing Company (Grand Rapids, Michigan) releases their Curmudgeon Old Ale in the Spring, I tend to reserve my drinking of old ales and barleywines for the Fall and Winter. Hence, when I contacted the brewery to let them know about my blog; I was excited when they offered to send me a couple bottles of Curmudgeon Old Ale in time for the arrival of the colder Fall weather. As you can see in the picture above, the beer poured a beautiful Amber color with orange hues around its edges. It was topped by a half finger off white head, which quickly dissipated to a ring around the top of the beer and left some nice lacing and alcohol legs on my founders brewing co. snifter. In addition, though a fair amount of carbonation was visible around edges of the glass after pouring the beer, it did not translate into too much carbonation in the taste (on the palate). 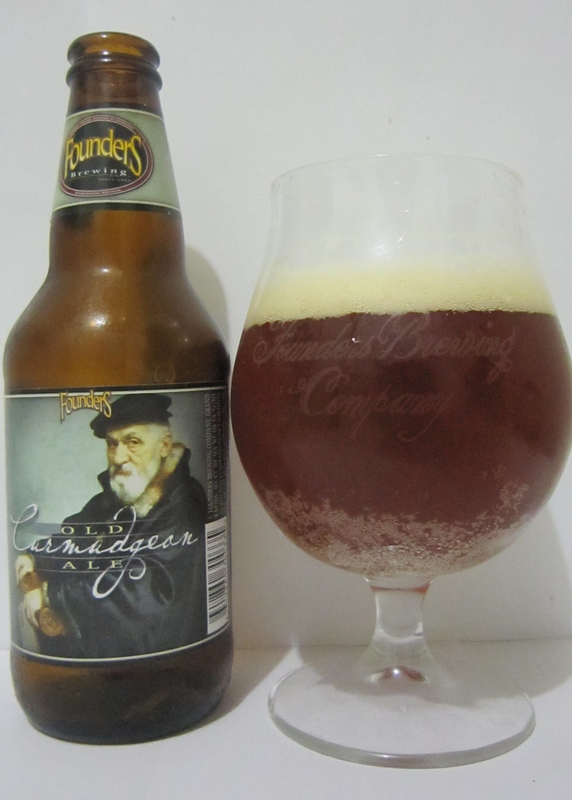 After admiring Curmudgeon’s appearance I took a nice whiff of this malt forward beer’s rich aroma which consisted of robust caramel, brown sugar, toffee, and molasses. All of which reminded me of a scotch ale, but after a couple more whiffs I picked up on the beer’s drier and not as sweet smelling old ale character. At 9.8% ABV there were some boozy / fusel alcohol notes in the aroma, but not enough to get me worried before my first sip. This entry was posted in Beer Reviews and tagged barleywine, beer blog, beer review, craft beer, Curmudgeon Old Ale, Curmudgeon's Better Half, Dave Engbers, fall beers, Founders Brewing Company, Old Ale, traditional beer style. Bookmark the permalink.